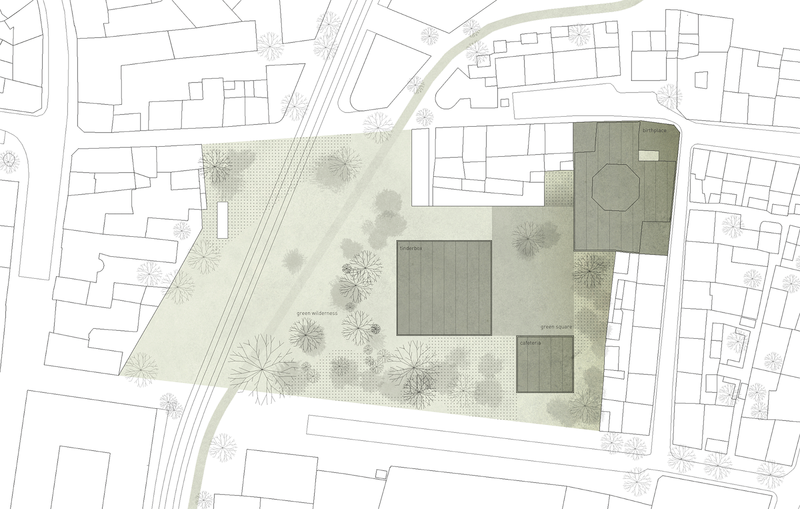 The creation of the HOUSE OF THE FAIRYTALES is a shifting opportunity to reset the Loetze’s Garden into an important gathering place, becoming a pivotal location in the center of Odense. The city transformations, that will reconnect the center, face an historical site with potential to evolve into a conceptually strong urban structure – especially when rooted to themes developed by one of Denmark main figures. From the overlapping of these stories, the concept and the rich context, results the structure of a museum that can be summed up to three assertive gestures. The INTEGRATION in the existing buildings, embedding Hans Christian Anderson birthplace and shaping itself to the remaining block, consolidating it. The STANDOUT of the museum as an iconic and referential building among the trees of the now extended garden. An action strong enough to wonder and inspire, becoming an important landmark that can, not only attract foreign visitors but also contribute to a singular living space. The DEFINITION of an entrance square through the placement of a cafeteria setting a spatial hierarchy along the garden. These three moments are connected underground, following a path that runs through a succession of spaces and motifs that blend the history of the writer himself and his work. One of the key elements of the proposal is the green space and its expression. Enhancing its intensity is crucial, so as its relationship with the museum. These two premisses will allow transforming the scope in a real gateway into the writer's fairytale world. The evolution requires more density and depth, transforming the garden into an urban enchanted forest that can carry the visitor to a scenario of wonder. Away from a mimetic interpretation, both the garden and the museum complement each other seeking to recreate a sense of the fantastic in a contemporary way. The chance to experience an adventure rooted to the folklore tradition present in Hans Christian Anderson tales. The Lotze´s Garden stands as an extension of the city day life creating the perfect set to Hans Christian Andersen House of Fairytales. The construction of the three building blocks defines the approach towards the city, as well as the functional principles of the museum, allowing the garden to be defined by two major spaces: the green wilderness and the green square. 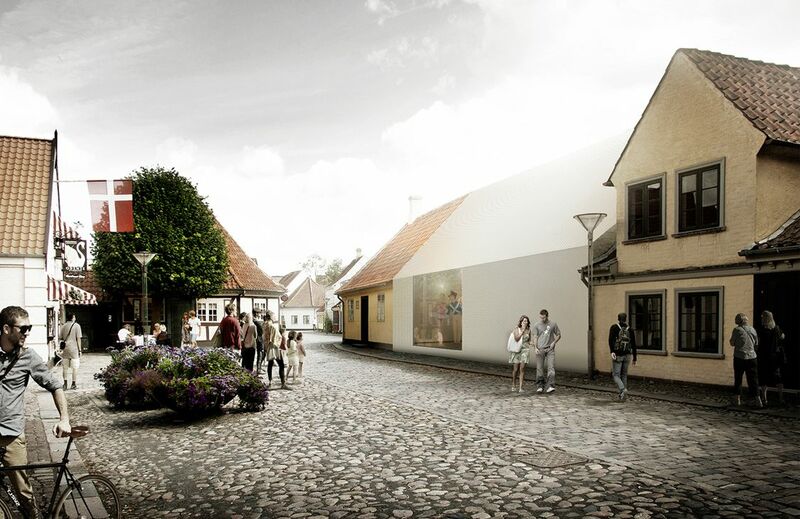 The green wilderness acquires a natural expression - resembling a forest - a new hearth in the Odense city center that exhales a magical atmosphere, perfect for the discovery of the House of Fairytales. Characterized by big trees, diverse vegetation and water running on its grass, the paths along the garden frame a season-changing scenario where the magical journey starts. The green square is set in the garden as a gathering space of all the museum facilities. Being closer to a human scale and with a more controlled natural environment, it is shaped for hosting open air events and social gatherings. A green core, intimate, cozy, light-full, with a major role in the Odense and House of Fairytales activities. The Tinderbox represents the metaphor of the House of Fairytales conceptual approach. Cantilevered in the nature as an iconic magical box - surrounded by trees - the Tinderbox is the gateway to Hans Christian Andersen universe. 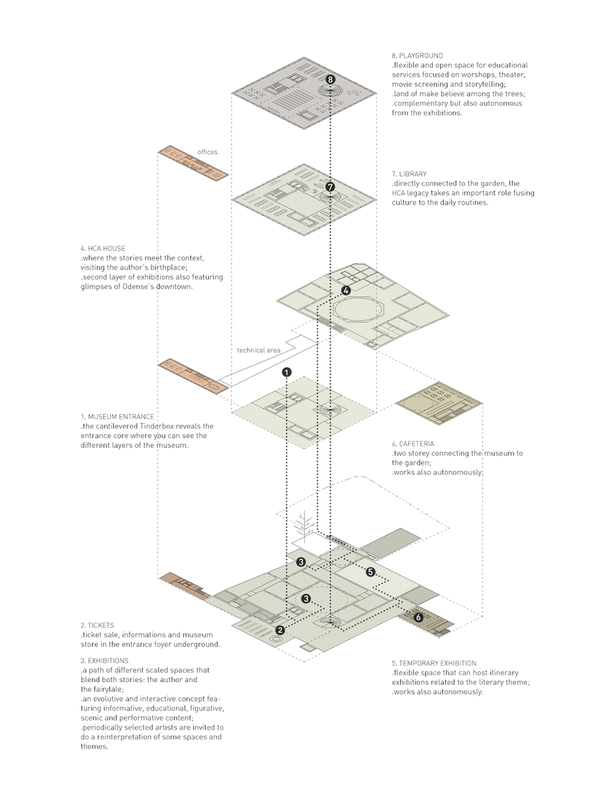 Standing in three circulation cores, the permeable ground floor allows to percept the different layers inside the museum. On the other hand brings the garden closer to the main foyer, where large scaled glazed surfaces frame the outside vegetation that slowly appropriates the building itself. This core connects all the different spaces inside the museum. From the exhibitions to the birthplace, passing through the temporary exhibitions, cafeteria, library or playground. Just like a fairytale structure, a path is set with a succession of motifs or episodes that allows the visitor to wander different ways writing his own story. Occasionally the course is interrupted with glimpses of the garden through patios and skylights, keeping a visual connection with the green surroundings despite being also developed underground. The knowledge and understanding of the author´s life and work is set through a fusion of the current material with new interactive content. An evolutive concept featuring informative, educational, figurative, scenic and performative content, addressed to all kinds of public. The sequence of different shaped spaces and their diverse scales allows to establish a flexible exhibition basis - being able to host any kind of exhibit material and strategy. Movie screenings as well as interactive displays integrate sequentially the author´s assets, combining the past, present and future. Some spaces will feature a scenic motif. These temporary installations will be part of the museum evolutive strategy, aiming to offer storytelling experiences in a non perennial way. Periodically selected artists are invited to do a reinterpretation of the most famous stories and themes from Hans Christian Anderson work. The museum is responsible for this curation, adding a more dynamic structure that will not only increase the museum private collection but also renew the international curiosity. A temporary exhibition space is also set to host complementary themes and authors, in order to enrich the cultural experience. It can also be used to enhance new artistic values, respecting the author’s legacy, or even be used a small auditorium for presentations or cultural gatherings. Being able to develop the museum in the exact location where the author grew up is an important opportunity that should be enhanced. The house is left as it is, making the museum adapt itself to the morphology of the block, respecting the scale and the iconic role that the house has in the street atmosphere. This second layer of exhibitions embeds not only the Birthplace House but also the Memorial Hall and some townhouses. In the exhibition concept this is the opportunity to give a context to the story, framing the old city and giving authenticity. This succession merges in a unique, simple, fluid and colorful promenade, pursuing a magical immersion into the world of fairytales. The Tinderbox is the starting point of the journey, but also its closure. The upper floors host the LIBRARY and the PLAYGROUND. Two important complements of the exhibition course that can also function autonomously. Directly related with the garden daily routines the LIBRARY is also its extension, gathering the author’s collection and offering an important cultural legacy to the city. The PLAYGROUND is where the educational services take place, focused on workshops, theatre and storytelling activities. The course ends where it starts, and with the same close relation with the garden, now in a upper level between the canopy of the trees. A strong conceptual approach that brings together contemporaneity and a bucolic environment, where the path and discover of each single visitor will expectantly become a story worthy of a fairytale. 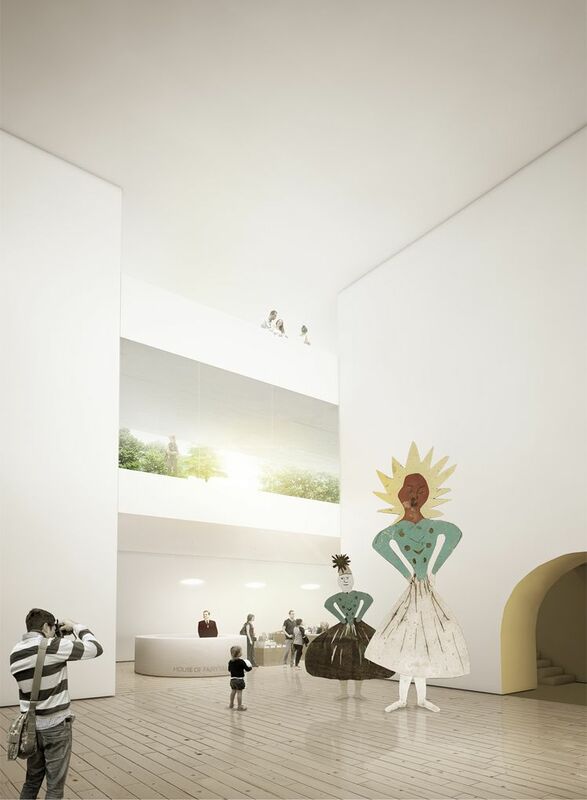 The site intervention ensures the possibility of a phased construction of the project, making sure that the Hans Christian Andersen Museum in Odense doesn´t close completely. If it is the promoter intent, the museum can still be open during a first phase of the project that acts on the museum facilities around Hans Christian Andersen birthplace and garden cafeteria. This operation will affect mainly the perimetrical area of the block, consolidating the existing townhouses, and small areas of the garden. The second phase regards the rest of the facilities and can be done while the museum already operates in the recently completed first phase areas. This will mostly affect the inner block, specially the Lotze´s Garden. After the second stage completion the 6000 sqm fairytale-centered experience will be expecting new visitors.